Your background is so effective and the stamping works so perfectly! Thank you for playing along with the Cheerful Stamp Pad. A beautiful birthday card in great colors. What a beautiful B'day Card for our challenge at the Cheerful Stamp Pad!!! Love the stamped images!! 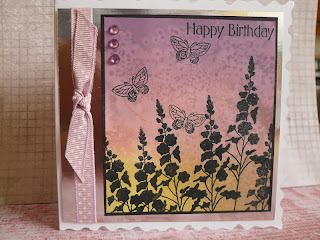 Love the background you have created - so pretty, and just looks so right with the Lavinia stamps.